This grilled dish is great any time of the year. It's colorful vegetables are filled with nutrients like vitamin C, fiber and vitamin E. Beef is chock full of vitamin B12 and iron. Try this kebab with chicken for a leaner alternative. Cut meat into 20 (3/4-inch) cubes. Sprinkle Worcestershire sauce over meat. 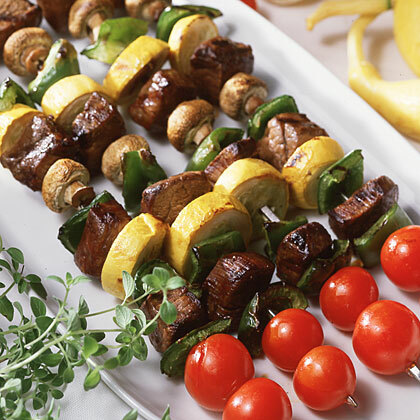 Thread meat, bell pepper, tomatoes, mushrooms, and squash alternately onto 5 (12-inch) skewers. Sprinkle evenly with black pepper. Place kebabs on grill rack coated with cooking spray; grill, uncovered, 10 minutes or to desired degree of doneness, turning once. Sprinkle evenly with salt. Tip: If using wooden skewers, be sure to soak them in water 30 minutes before threading to keep them from burning during grilling.